CAMPING CUTLERY – Made for all Outdoor-Fans who like tools without any poppycock! Reduced to the essentials gadgets: coffee spoon, spoon, knife, fork and bottle opener in a weatherproof neoprene bag! STAINLESS STEEL – This camping cutlery is suitable for all weather situations: The cutlery is made of stainless steel, the bag is made of high-performance neoprene! NEOPRENE BAG – The camping cutlery comes in a high performance neoprene bag which makes the transport in a backpack very easy, even if it is still wet from the last washing up in a mountain brook. SPACE-SAVING & LIGHTWIGHT – Measurements 21 x 6 x 2 cm and 110g. OPTIMIZED FOR OUTDOOR PROFESSIONALS – The camping cutlery is made for all outdoor areas, its length of 18,5cm makes it perfect for your kitchen too. Traveling the world and you never have the right cutlery? With this outdoor cutlery you are always well prepared: Whether you are camping, climbing, traveling, having a BBQ or backpacking, the right cutlery set is now always with you! 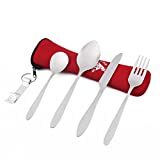 The cutlery set is made of stainless steel and comes with a weatherproof bag made of high-performance neoprene. With 110 gram this cutlery travel kit is a real lightwight. Big advantage: The cutlery set can be stowed in the waterproof neoprene bag, even if it is still wet from the last washing up in a mountain brook. This is a product of “OUTDOOR FREAKZ”, made for you, people who love outdoor activities, to improve and simplify your outdoor life. All you have to do now is to enjoy the experience! BEZZEE Extra Large XXL Beach Blanket Sand proof Water Resistant Rip stop Parachute Parasheet Nylon for Garden Park Yard Family Camping with Sand Anchor Pockets and Integrated Storage Travel Carry Bag.